This cabinet exhibits the raised gesso technique of decoration known in Tibet as “kyungbur”. This is an extremely important technique coming into decorative use in Tibet about the 19th and early 20th century, when Tibetans were allowed more artistry and freedom of expression. The technique can be likened to the decorative icing of a cake, except the ingredients were gesso, glue, resin, sugar, and linseed oil to prevent cracking. This technique was used only on furniture and woodwork but never on thanghas. The construction of this cabinet shows influence from the Chinese. The top and side frame members have mortise-and-tenon construction, a traditional method popular in China. A recessed narrow waist in front has relief carving of angular T-fret or key-fret design, a motif signifying prosperity and one very popular in China. While this cabinet shows construction influence from China, Tibetans, however, are really not particular about how a piece of furniture is put together as in the high plateau that makes up most of Tibet, only softwood such as pine and fir is available as building material. As the people in this remote area love colors, they paint their furniture with vivid colors and place the value of a piece in colorful paintings decorating their furniture. Tibetan furniture is really ‘paintings on wood’. The red lacquer applied to the top of this cabinet has faded in areas revealing there was a thin black underlay. The cabinet has four doors in the center, with four smaller panels on the sides and three more across the bottom that are fixed. All the panels and doors are constructed using the floating-panel technique, similar in basic design to a picture frame. The doors pivot on tenons and can easily slide in and out along grooves on the frame members. The metal pulls and coins acting as escutcheon are original. The sides and back have recessed panels. A shelf divides the space inside. All the front panels on this cabinet have a red background. This red comes from cinnabar and provides a wonderful backdrop to expose an esoteric ensemble of indigenous animals painted on the front panels. The four center panels have raised gesso paintings of a tiger, a mythical snow lion, a stag, and a white elephant, embedded amidst also raised-gesso foliage and flowers. On the small side panels are the deer, goat, jackal, dog, horse, snow leopard, and Tibetan antelope. Many of these animals have symbolic significance in Tibetan art, representing transmutation of anger into wisdom (tiger), luck and happiness (snow lion), longevity and prosperity (deer and antelope), and royal authority as well as appropriate vehicle for offerings such as precious jewels to Buddhist deists (elephant). Of special significance is the white elephant, which is revered as the mount for the Buddha and the reincarnation of Buddha. The frame surrounding each panel is decorated with floral design, also in raised gesso technique. The effect of this technique is to bring forth a tactile experience, that of “within reach”, a positive association for a Buddhist who owns or uses the furniture so decorated. The top panel of this cabinet shows an excellent patina of age and use. 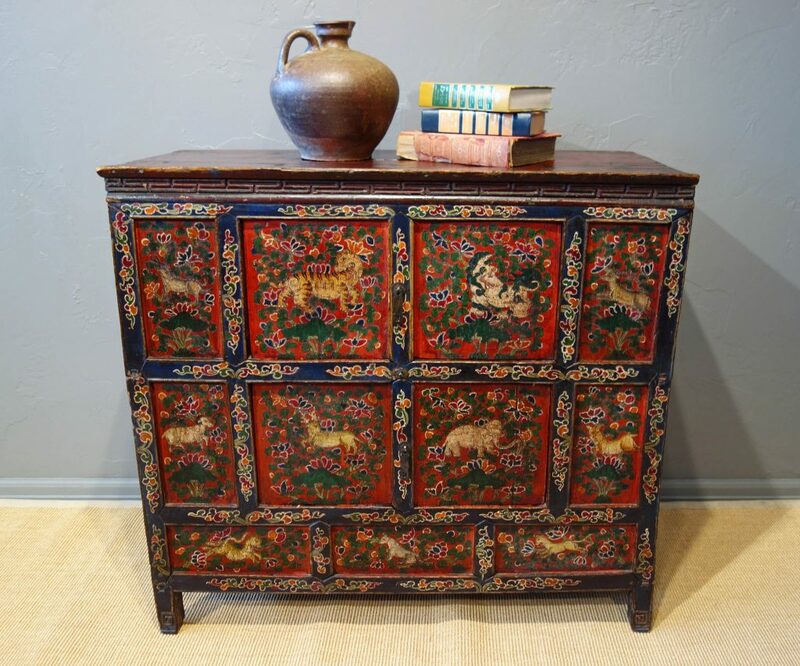 There is no question this cabinet is an authentic Tibetan antique, which is now quite rare as so many Tibetan art and furniture were vandalized or destroyed during the Cultural Revolution of the 1950s. Later, what survived was not allowed to leave the country. Many Tibetans and neighboring Nepalese have been busy making reproductions to sell to tourists and unsuspecting collectors. A piece of furniture decorated in the “kyungbur” technique is very hard to reproduce. This rare cabinet has survived in excellent condition and the vibrant decorations would make it stand out in any room.